This year our family got to participate in our church's "A Night in Bethlehem". It's a tour/journey kind of experience where those who attend travel with a guide on a journey to pay their taxes. Along the way they experience & observe some of the things that would have happened at that time and they end up being present at the manger scene. Our family portrayed a family that had fallen on hard times during their journey to pay their taxes. This is a picture of the girls & I in our costumes. It was a great experience, I think. We got to go through the whole thing as a cast at the end of the night (with each group stopping to act out their own stop along the way). I love the opportunity to focus on Christ and what really happened, and what Christmas is really about! 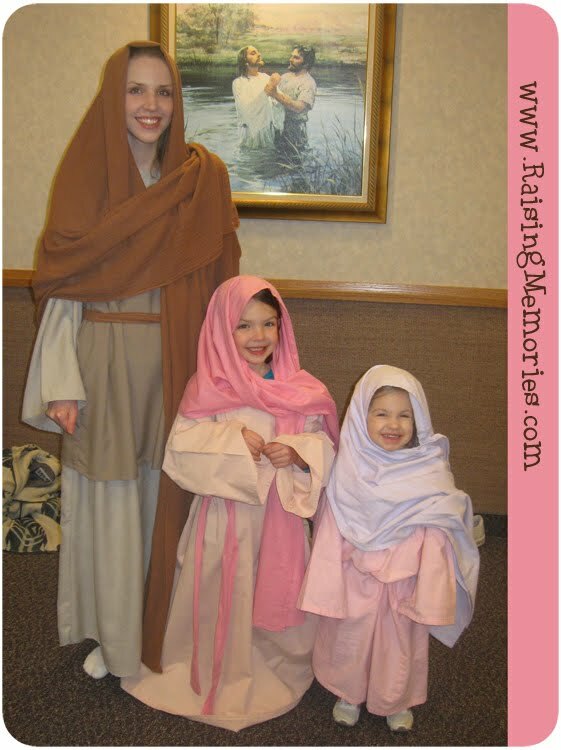 Do you have any traditions that involve acting out the nativity?